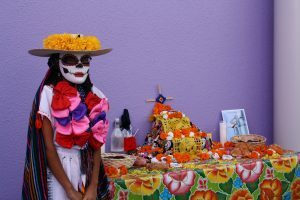 San José, CA – October 2016 – In the Latino culture, Día de los Muertos helps children celebrate life and not fear death. This year Children’s Discovery Museum of San José will offer special activities geared for children four and under, in addition to the traditional Día de los Muertos’ activities at the museum’s annual celebration that remembers and honors the dead. The program is part of the museum’s Cultural Celebration series and will be held on Sunday, October 30 from 12 noon to 4 p.m. All activities are included in the price of admission. 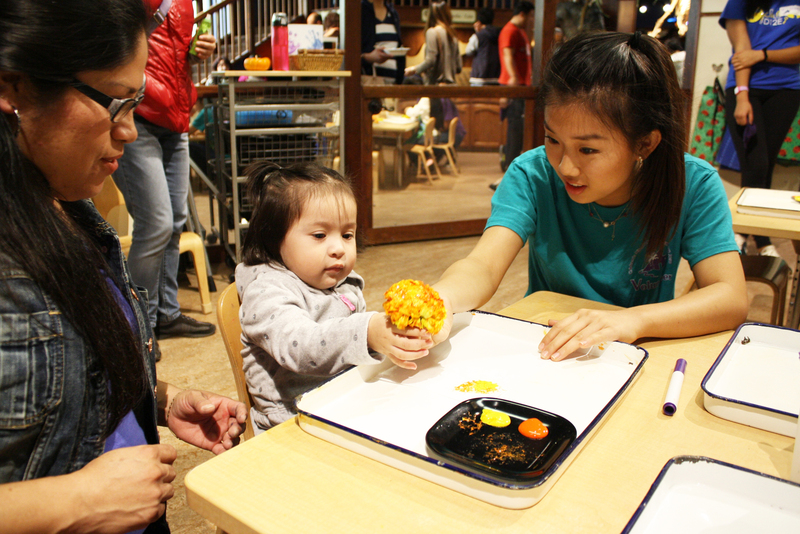 Using a marigold as a paintbrush, the youngest visitors can create their own masterpiece in the Wonder Cabinet Art Loft and join in an interactive storytime selected special for this day. 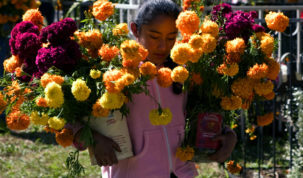 A child is offered a cempasuchitl flower, by her mother. 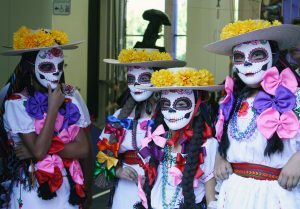 The day features clay skull-making and decorating, mask-making, and the opportunity for kids to paint their faces like a calavera or skull. 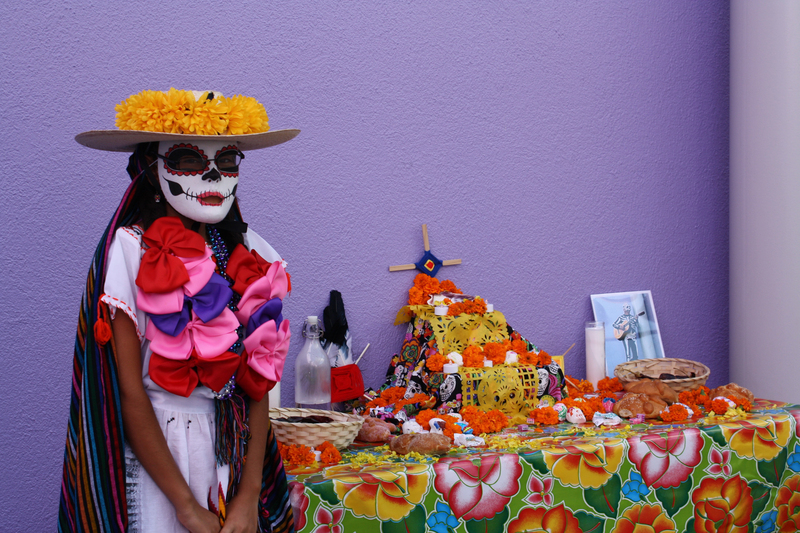 There will be music and dance performances and a procession led by the artistic troupe, Teatro Familia Aztlán, dressed in skeleton costumes carrying large papier mache puppets. 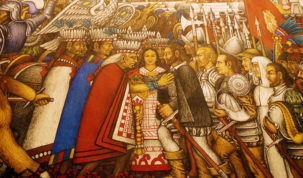 The museum’s procession is uniquely exciting compared to others in the community – it includes a stop at Lupe, the 14,000 year-old “muerto” mammoth. Young girls wear masks during the celebration. Before the performances begin, visitors are invited to write down the names of loved ones who have passed and say those names aloud to the audience. It’s a touching way the museum provides the opportunity for parents, children and family members to learn about and celebrate traditions and customs together. Visitors are invited to bring a personal memento to share on a community altar created for the day. They can also visit a spectacular altar created by artist Lissa Jones in the Oaxacan tradition that will be on view through November 6.